>Saturday was filled with errands, but the highlight of the day was clearly our visit with the newest member of the family – Clara Brianne. The girls were so excited to meet their new cousin, and Uncle Jay Jay was pretty darn psyched as well! The girls ran in, washed their hands, and lined up on the couch! And yes, then Auntie Ra Ra jumped at the bit. I’m sorry – I just couldn’t contain myself! Emma is totally a natural. She takes such good care of her baby dolls…she had it down. Support the head, gentle cradle…the whole nine yards. And she even smiled for Emma! Then Uncle Jay Jay got his turn…she’s so tiny in his arms! Uh-oh. Don’t even think about it… we are man to man. Zone defense is a whole other game! Maddy made Clara a fuse bead butterfly to hang in her window…and she opened her eyes to check it out! It was a short but very sweet visit, but I think any visit with someone so precious is always too short! I think I found the best veggie burgers. And I am forever grateful for their taste, texture, and ease of cooking…since this week I needed something quick to throw together to take to work for lunch. Yay, Blue Mango! Made in Portland, and consumed frequently from now on wherever I am! Let me share that they are a great texture, with just a hint of kick, and the flavor is delish! Not reminiscent of cardboard like some other veggie burgers. These actually had some moisture, heft, and were filled with pure enjoyment! My stand by: egg whites, baby bellas and spinach. And, of course, goat cheese. Skip ahead to Friday, because again – it was that kind of week. I had a cavity filled on Friday morning. May I remind you, I hate the “dentist.” Not my dentist, because he is angelic, talented, charming, and most importantly, gentle and kind. Especially when he has both of his hands inside my mouth and that little drilling thing. He takes his hands out of my mouth if he asks me a question, but really, he chats me up before hand, gets the job done, and we chat after. Ahhhh, a dentist with manners! Since I was numb for most of the day, I made an easy to eat (and cook!) lunch. Pre-made lentils from Trader Joe’s, steamed and peeled beets (from Trader Joe’s), shelled edamame (again, Trader Joe’s) and goat cheese (Vermont Creamery). A nice warm salad with minimal chewing required! Then, Friday night ended the week perfectly! My cousin Rachel invited me and Mary Beth – our other cousin and my “big sister role model” – over to her new place for dinner. Rachel and Kate have a beautiful apartment in a fab location in Newton. Its a stone’s throw from where one of my friends grew up…among other places. Love it! Dinner – Rach, Oh MY! – so good. Homemade meatballs and sauce, spinach pasta, whole wheat garlic bread…you spoiled us! Everything was perfect – from the snacks to dinner, to the conversations. You ladies have no idea how good it was to have you to talk with, laugh with, and share. You both inspire me, and are so beautiful, strong, and sassy. And its kind of crazy (you know, creepy in a good way) how similar we are deep down inside. I’m glad I finally figured it out, but hope that we can share many more days and nights like last night. And one of the sweetest discoveries of the night: Organic wine is kind to you in the morning! 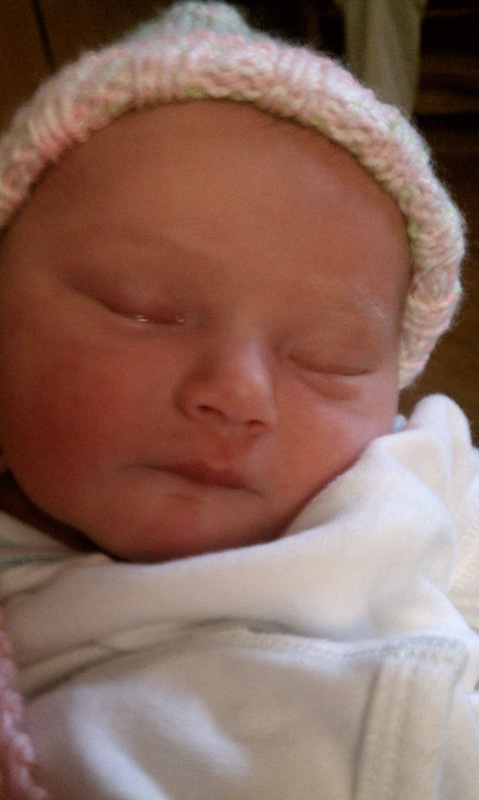 Welcome to the world, Clara Brianne. What a gorgeous little girl!!! And I get to spoil her! How lucky am I?!?!? I honestly have to say, I’ve loved the quality time with Des over the past few days – and he is the cutest little boy. Ever. After dinner on Thursday night, still at the table, I said to him, “Who is auntie’s favorite handsome little boy?” His response: “Unca Jay Jay.” We laughed, and then I said, “Yes, but who’s my favorite little boy?” He just smiled, knowingly. He’s got it locked up. The rest of the Websters are very excited to meet her this weekend! In fact, its 7:30 am on Saturday, and I’ve already been asked 5 times if today is the day we get to see Baby Clara!!! Congratulations Bridget, Brian and big brother Desmond! Looks like we’ll see you soon!!! Have I ever mentioned that Friday is my favorite day of the week? It is…it kicks off the weekend, its a very administrative/catch up kind of day at work, and sometimes, just sometimes, I can work from home. But, I do love that working from home means lunch with my little one! Friday night was uneventful – movie night! I love the snuggle time on the couch with my girls and Jason. Saturday morning brought my typical breakfast on the run…all natural whole grain english muffin, Teddie’s Natural unsalted peanut butter, a 1/2 banana and ground flax seed. After breakfast, Jason, Emma and I ran errands: Marlborough Savings Bank, looking at garage doors, a quick lunch at Wholly Cannoli in Worcester, and then new dance shoes for the girls. After we stopped at home, I snuck out for some new running sneaks and SuperFeet. I really hope this does the trick and I can get back to running this week! Saturday night was our family St. Patrick’s Day dinner, combined with a St. Joseph’s Day celebration so both sides of our “Boston Cocktail” heritage were represented. Poor Auntie…she is so ready to have this precious little girl…but is still all smiles! Mmmmm, corned beef and cabbage with all the fixin’s was soooo needed. I love traditions! Mangia tutti! Zeppole for St. Joseph’s Day. Thanks, Gerardos (and Brenda for sharing where you got yours)!!! Everyone definitely ate well…and then, sugared up, we sent everyone on their way. Look at this hat! Uncle Sean loves it too!!! For now, let’s talk foot and food. But separately. I am not a huge fan of feet…so it would be gross to talk about them together. My foot it still killing me, but by the time I got the chance to call the Doc today…it was after hours. I will totally call tomorrow, see the doc hopefully this week, and then head out to buy new sneakers! So how do you combat that at the end of the work day? A nice cold beer while cooking! Dinner tonight was grilled lamb and goat chops from Springdell Farms, sauteed kale, and couscous. The meat and couscous recipes were from Tosca Reno’s Eat Clean Diet Recharged. The kale was sauteed with olive oil, minced garlic, sea salt (which wasn’t necessary), pepper and crushed red pepper flakes. Good, and quick!! The sauteed kale was easy…took all of 3 minutes…and check out the steam! My grill master. They were cooked perfectly, despite the flames. Today’s News flash: I resisted the urge to order one of Panera’s chocolate chip cookies today while at a meeting in Newton Center. Unfortunately, I thought about that addicting chocolate the whole way home. Man, there are times (many, many times) that I miss chocolate. I try to avoid the urge to reach out for it…and save it for a little treat. Its not easy to let it be, especially when its on my mind. Luckily, my bum foot won’t impact my ability to do crazy amounts of sit ups. Sheesh. So proud, yet so sad…all at the same time. >Feeling old, or being out of shape? I’d like to think I’m in descent shape. I’d also like to think its true…but yesterday’s Celtic 5k may have shined a bit of reality into my rose colored perception. I still don’t dedicate enough time to the keeping of me. Clearly, since my foot is still screaming when I walk. The hip flexor and the knee have recovered for the most part, but the outside of my left foot is very displeased with my attempt to run a 5k with very, very little training. Ok, it’s down right pissed. So I need to start putting a bit more time into my working out since this “accept a challenge, recover from said challenge, repeat” pattern isn’t working out so well. So, it looks like we’re going to try to get into the BAA 5K in April. It always takes a race to get me excited for the next one, however, I didn’t plan on the time and patience for an injury. I’m not sure how much room is left, but I don’t want to commit to it until I can at least put all my weight on my foot. Here is reason #77 why I should dedicate more time in my day/week to working out/training. At least the evenings are beginning to hold a little more daylight now…there is hope! Now that I’ve thought about it…as much as I hate to admit that I’m out of shape…I’ll do that before I claim I’m getting old. However, no matter how I look at all that’s on my buffet-du-life, blogging is one thing that I want to give more time to. I have been checking out some new blogs thanks to twitter, and I am starting to realize that I want to take the Perfectionista to the next level. There are so many more…maybe I’ll give some highlights in upcoming posts! I love all of these blogs that I’m discovering, and am really working toward amping up mine over the next few months. How do you do it ladies??? If there is a secret, please, pretty please, let me in on it!!! In the meantime, I am trying to get organized for a week filled with a family funeral service, trying to get ahead at work, sneak in some jewelry work, and a 5K on Sunday that I am in no way ready for! And, poor Maddy has strep again. Will the rest of us be lucky enough to avoid it this time, too??? But, before I leave this haphazard post, I do want to share some highlights from the past week or so…because its not all stress and juggling…there is definitely some fun in the Perfectionista’s life! March 1st, my nephew Desmond turned 2. I scored a train cake mold at the William Sonoma outlet in Wrentham a month or so ago for 6th of the original price, and asked if I could make him a cake…and decorate it like Thomas. I had no idea what I was getting into…but with the help of the Wayside Penny Candy Store and their stock, I pulled it off! It was the same recipe that I used for Maddy’s basketball cupcakes a few weeks back. Not great for decorating, but it was definitely tasty. Even Beppo liked it! The next day, I went to an event at the Perry School in South Boston where Tyler Seguin (Bruins rookie center, #19) came to celebrate the Jump Rope For Heart program, and yes, jump rope! He is actually 19 years old to boot. We won’t linger too long on the fact that I may or may not be old enough to be his mother. But what a great guy! And talented on top of it all! That night, I wanted fish for dinner and tried a Patti and Larry inspired meal…fish in parchment! So…here I am. At the end of the post. Ready to get to bed and start Lent tomorrow with some, well, determination of some sorts. My colleague Kathy inspired me to take on the 3 S’s of Lent: Study, Service and Silence. I think I’m going to try it…on top of giving up chocolate (hah! ), ice cream, and all of the other things I should be eating less of! This will be good for us to re-group and re-ground, and if anything, I might get 15 minutes or so of quiet me time. This could be really really good…or dangerous depending on how long I’m left alone with my own mind! As always, I love your comments and feedback…so comment away! >I love Maine. When we get in the car, destination Maine, something crazy comes over me. Its a strange sensation of calm, relaxation, that ahhhhhh that I don’t often experience and I love it. Friday, we left to visit my in-laws in New Gloucester, the perfect way to end the kids’ school vacation week. Yes, I used perfect and my in-laws in the same sentence. They are! When we’re there, its like being at a full service, all inclusive resort. I’m not kidding. Neeny loves to cook, do laundry, spoil the kids, and make sure the fridge is fully stocked. Papa keeps Jason entertained with cribbage, planning the next batch of brew, or playing catch with the dogs. Its actually like a real vacation for me!!! As I typed this, Neeny brought me a freshly heated cup of coffee. No joke. It’s like a little piece of heaven for two and four legged family members! We arrived on Friday after driving through rain, slush, sleet and snow to a delish dinner of make your own grilled steak and or chicken salad. We had some fin as the girls used their new Crayolas and drawing books to write us stories for bedtime! Saturday, we got up way earlier than I had imagined possible, ate Papa’s homemade waffles and then packed up for a day of snowshoeing! Holy exhausting!!! And I thought I was in kinda good shape. Maddy kicked our butts…wanting to keep going, silly girl. It was beautiful, and when Emma, Nenny and Papa turned around, Maddy ran ahead and kept Daddy and Mommy trekking. Neeny looks so good in her element! After we got back to the car, we ate our picnic lunch that Neeny packed, and then headed into Freeport for some shopping! My girls are growing like weeds, and seem to always need new clothes…so luckily, I scored some great deals at the outlets and Maddy seems happy with her new selections. When we got home, hot showers all around and then the perfect dinner of homemade Mac & Cheese, steamed broccoli and salad. Totally hit the spot! When the kids finally crashed and went to sleep, I got a chance to veg on the couch and finish the Alchemist.Very thought provoking (just what I needed…more in my head) and its left me with a few questions. What is my Personal Legend? And how will I know that’s it when I think of it? I mean, I want to do so much in life, be so many things to so many people…I guess its buried somewhere in all that. Maybe this is what I need to focus on, my search for clarity. Could this little getaway get any better?? Well, come Sunday morning, we were lounging around at 7am with Caramel Nut Crunch coffee waiting for everyone to slowly wake up…and then we headed to a local breakfast joint that snowmobilers frequent before we headed home. So yes, even that could get better! Love you, Neenster & Papa!